Olive kids toddler bedding includes variety of comforter and sheet sets in fun, traditional-style patterns and designs that children will love. No cartoon characters or Disney superheroes here: these are timeless designs that you might have had on your own bedsheets as a toddler—if you were lucky enough to have beautifully designed bed sheets on your bed—and they will be just as much ‘in’ ten years from now as they are now. Toddler bedsets from Olive Kids always include a flat and fitted sheet, a pillowcase, and a comforter; so everything you need to get your child beautifully setup except the bed itself and its mattress and pillow. Whatever pattern you get, the bedsheets and pillowcase will be 100% cotton; as is the cover on the comforter, the comforter batting is the only polyester in these sets. Remember, a toddler bed is the same size as a crib, so these sets are meant to fit crib mattresses; if your toddler sleeps in a larger twin bed, you’ll want to look up twin-sized Olive kids bedding rather than toddler-sized. For your pretty in pink toddler girl there’s a Paisley Dreams Toddler Comforter Set:a pink comforter with colorful paisley swirls, butterflies and ladybugs, and a white pillowcase, fitted sheet, and flat sheet with the same paisley swirls, only smaller. To make this set look really nice, you can get a few plush throw pillows for your daughter to enjoy on her bed during the day time; beautiful, soft square pillows that coordinate with the set beautifully. If your little boy is all into real life super heroes, the Olive Kids Heroes Toddler Comforter Set may be ideal. 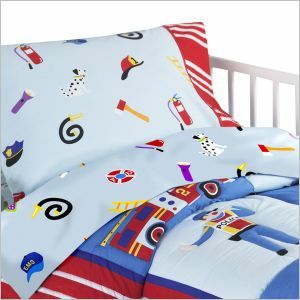 The blue comforter showcases policemen, firemen, police cars and fire engines, and the light blue sheets are sprinkled all over with the tools of the trade: fire helmets, ladders, and Dalmatians. For a transportation set, you’ll have to buy a matching comforter and sheet set separately. The Olive Kids Trains Planes, Trucks Toddler Comforter is a brightly colored toddler sized comforter lined with soft cotton flannel. Flying airplanes, a serious convoy of trucks and a fun train and caboose drive across the blue quilted background. 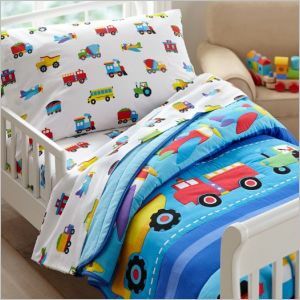 The 100% percale cotton toddler sheet set that goes with this fun comforter is primarily white, with lots of vividly colored engines, trucks, buses and airplanes driving or flying over it. The Dinosaur Land set from Olive Kids Toddler Bedding is another one where the comforter and sheet set come separately, but this one is also definitely cute enough to make it worth it. The blue Dinosaur Land Toddler Comforter is a quilted comforter, lined with soft cotton flannel and with polyester batting that is light enough for any season. 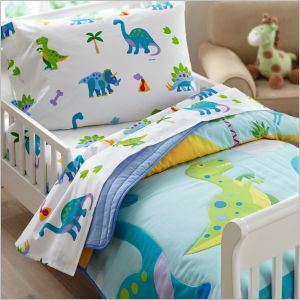 The crisp sheets, white with colorful dinosaurs walking over them, are made of 100% percale cotton. Whatever Olive Kids toddler bedding set you choose it’s certain to become a signature part of your toddler’s bedding. You may even find yourself packing the sheets every time you go away on vacation; sleeping on the familiar, much loved designs will make your toddler feel at home wherever he is.